I have found out in my 45 years of designing custom yachts one must drill the design process down to the most basic kernels of information, the “Look”. Distractions of details concerning number of staterooms and décor and the like need to be placed on the back burner, so to speak, and start at the beginning. In reality “looks” are but a small portion of the design process but SO important when applied to yacht design or any boat for that matter. Boats are special when it comes to “Looks”. We all have our own ideas of what is beautiful and that’s what makes it so interesting for designers like myself. I will even admit that there are a hand-full of designers and builders that I just love to look at their boats and so enjoy the time I get to study and ponder their design ability and talent. What is called the “Dinghy Effect” is where it all begins. If I have to explain “Dinghy Effect”, I don’t want you as a client, enough said. People see a good looking vessel, no fall in love with a good looking vessel, and at that moment they want their own version of her. Yes, their own version. 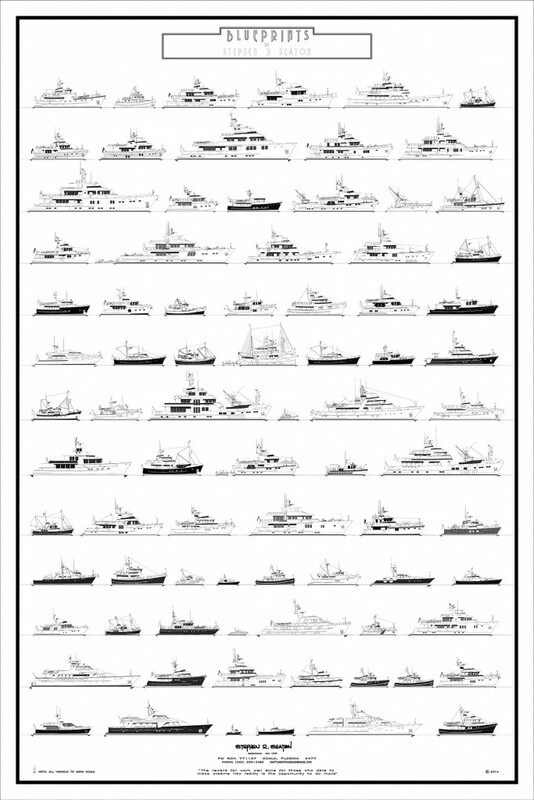 With over 534 designs I found that few clients that I deal with want what exists, namely production boats, you know the “Walmart of Boatbuilding”. Most clients have their own ideas of what the proper boat should look like. “Reinventing the Wheel” all over again, but to the extreme. My job is to take what is in your head and turn it into a tangible product. Now with that said, I compiled a collection of profile drawings that will help in the process to focus on a style or “Look” no more, no less. The drawings here are but a hand full of my designs. Some clients have photos of what they like but most describe a combination of several vessels combined into one, not unlike when God designed the Camel. This collection of profile drawings will help me in my work by letting us pick one or two and then proceed to sketch up a composite version to the client’s satisfaction. This process usually is done face to face and in most instances takes just a few hours or so. We will produce what has been called the “refrigerator door drawing”, many of which have then been turned into a real vessel. I can not tell you how important this initial meeting is as it sets the course for all to follow. So, for now just find the “Look” you like and we can size it up or down to fit your requirements, ocean to sail, or number of grandkids to accommodate. From there we will discuss what you expect to do with the boat. Most designs here can be modified with different hull designs, construction methods or cost limitations to fit one’s requirements. We will work on that later; so for now just have fun dreaming of this new project. One point to keep in mind is that these drawings on the poster are 2 dimensional but 3 dimensional in my mind. My designs are treated like sculptures in my head and thought of as fully formed objects. Each and every one of these drawings exists in my brain as “existing” vessels and I know what they look like from all points of view. So, let’s dig out the old back of the envelope or napkin and get started.